Have you had problems locating a particular section or quarter section? Do you want to know the Township, Range and Section number for your house? If so, the New Mexico PLSS finder application will help you. It lets you enter the Township and Section number and then identifies your area of interest. The application also allows you to search by USGS Quad Name. The application is located at the following URL: http://arcg.is/1aNGX65 or simply navigate to http://edac.maps.arcgis.com to find it. The United States Public Land Survey (USPLS) or Rectangular System of survey or simply Public Land Survey System (PLSS) is the most widely used surveying method in the United States used to describe parcel boundaries. The system was initially implemented in the Northwest Territories and subsequently in the remaining central and western states. The USPLS begins with principal meridians and base lines. The intersection point of these lines is used as an initial point for the survey. There are 35 principal meridians and 32 base lines in the US. Some states, such as Colorado and Nebraska, share meridians and baselines. The PLSS System then partitions the land into rectangles from an initial point (intersection of principal meridian and baseline). Range lines were then surveyed parallel to the baseline (north to south) at six mile intervals and township lines are surveyed parallel to meridian (east to west) at six-mile intervals, dividing the land into 6 x 6 mile squares called survey or congressional townships. In addition, each township was partitioned into 36 square-mile parcels of 640 acres, called Sections. Every section was then given a number from 1 to 36 depending upon its position within the township. A section could be further divided into halves, quarters and similar fractional parts. 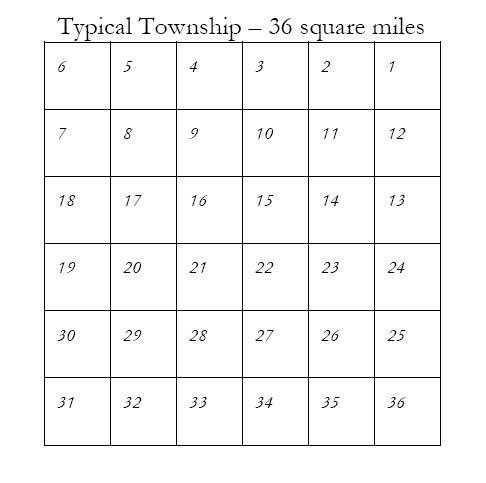 Township with Section Numbers. Source: New Mexico Mapping Manual, NM Property Tax Division. Section, Quarter Sections, Quarter-Quarter Sections, and etc. Source: New Mexico Mapping Manual, NM Property Tax Division. 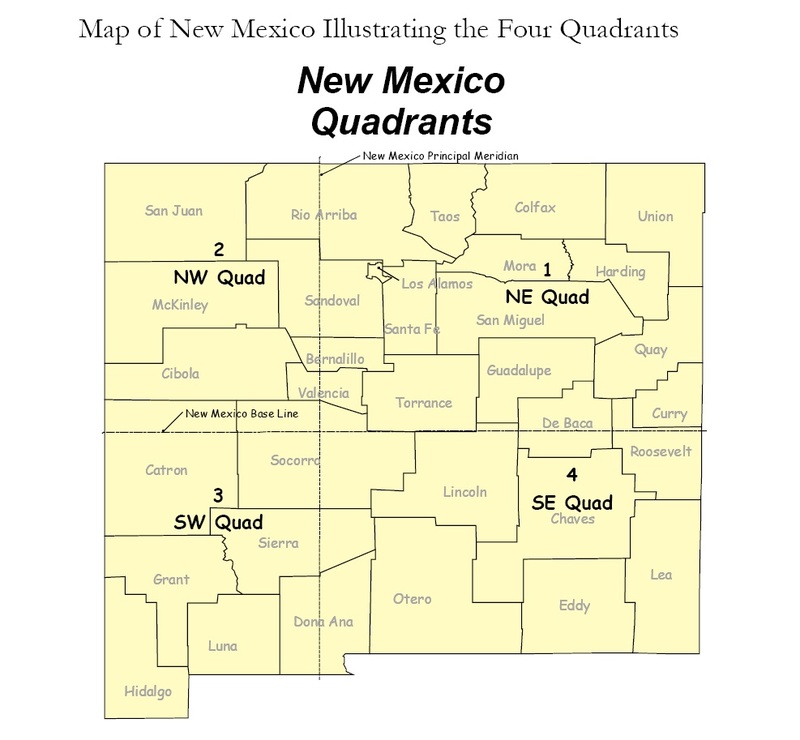 New Mexico has one base line running east and west and one principal meridian running north and south which divides the state into quadrants. These are officially referred as the New Mexico Principal Meridian and the New Mexico Base Line. The two lines intersect in Socorro County in the vicinity of San Acacio. New Mexico Quadrants. Source: New Mexico Mapping Manual, NM Property Tax Division. References: New Mexico Mapping Manual, prepared by the New Mexico’s Property Tax Division (PTD) pursuant to Section 7-35-4 NMSA 1978. http://www.tax.newmexico.gov/Businesses/geographic-information-system-.aspx. 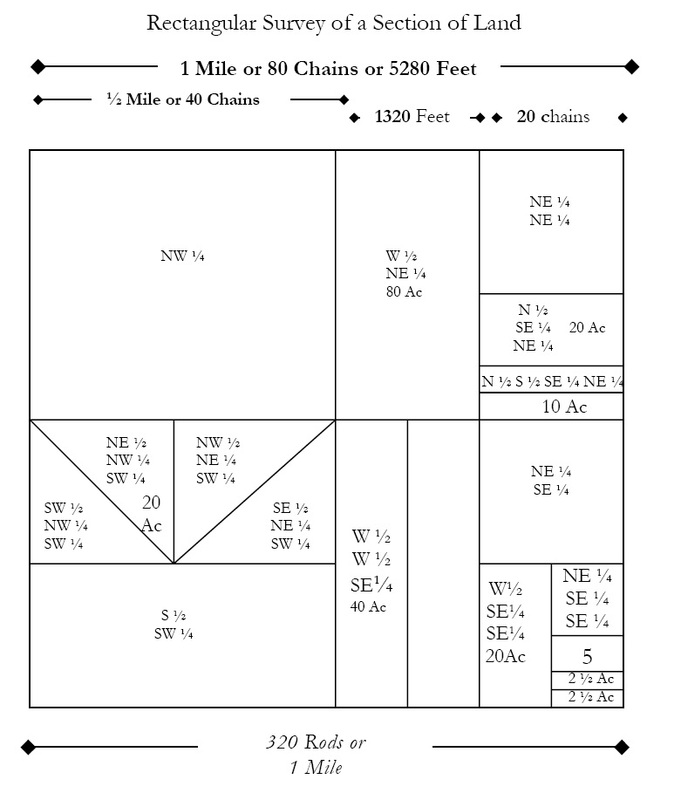 Tagged Baseline, Cadastral, New Mexico, NMTRD, PLSS, Principal Meridian, Section, Township.